2010 Ideal re-branding of classic Tip-It game. From the box: "Spin the spinner and using the "fork" (included) remove the color discs according to the spinner. 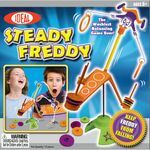 Be careful what discs you remove and be sure to have a steady hand, because if you tilt too much, you'll knock Freddy off his post! If Freddy falls on your turn, the game is over."